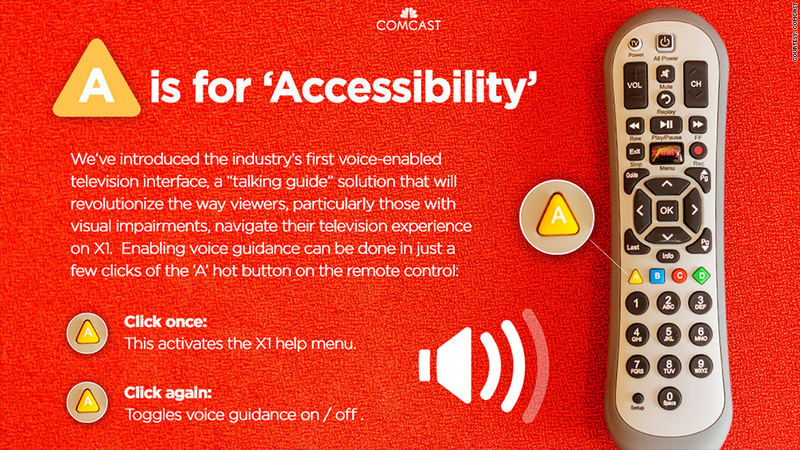 By pressing the "A" button, Comcast's X1 customers will be able to activate the system's new "talking guide." Comcast has created what it calls a "talking guide" for its cable TV system, designed to help visually impaired customers -- and everyone else -- navigate what's on live TV and on-demand. The "talking guide" is an addition to Comcast's X1, a state-of-the-art set-top-box and software package that connects to the Internet. Comcast has been deploying X1 in its local markets across the country. The company announced the new feature on Wednesday at an event in San Francisco. It will become available to all households that have X1 within a few weeks. The feature -- which I tested last week in a demonstration -- includes a very realistic female voice that helps users navigate through the X1's guide, settings, and even program descriptions via vocal prompts. For example, if you select a movie through video-on-demand, the talking guide tells you the film's title, its run time, and even its review score via Rotten Tomatoes. When Tom Wlodkowski, Comcast's vice president of accessibility (who is blind himself), demonstrated the feature for me, it seemed to work pretty seamlessly and efficiently. It only took two taps of the remote control's "A" button to activate the feature. It seemed to work much like the closed captioning function on most standard television sets, but instead for the visually impaired. The feature is just in its beginning phases, Comcast emphasized -- there are plans to give customers the ability to search in the future.